You need to cut a 5,5"x12 rectangle for the base and score it at 4" and 8" in the length. Cut a triangle in the last right section (upper corner). 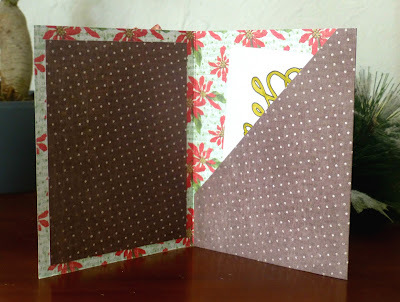 Cut two 3,5"x4,5" rectangle and adhere them in the front and back of the first section. Fold and adhere the left side and the bottom of the last section on the middle one. Decorate the front with flowers and alphas. The inside rectangle panel is for you to put a sentiment or a note. Done with day 2 of my 30 gift card holders. Don't forget to follow my blog and to left a comment to enter the drawing of my first giveaway before the 15th of December ! 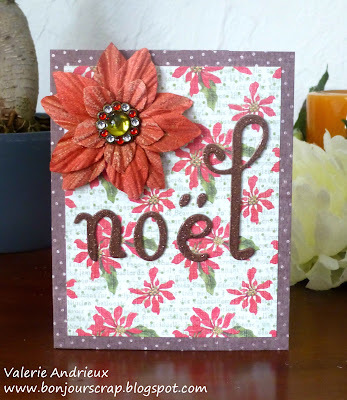 I really love this because of the beautiful poinsettia flower and papers! Just gorgeous!